Berikut ini adalah 'senarai negara berdaulat dan wilayah tanggungan di Amerika Selatan' a, termasuk ibu negeri mereka, bahasa rasmi, mata wang, penduduk, kawasan, dan KDNK tiap kapita di PKP. Amerika Selatan bersempadan di sebelah barat oleh Lautan Pasifik dan di sebelah utara dan timur oleh Lautan Atlantik. Amerika Utara dan Laut Caribbean terletak di barat laut. Amerika Selatan mempunyai daerah sekitar 17,840,000 kilometer persegi (6,890,000 sq mi), atau hampir 3.5% daripada permukaan Bumi. Pada tahun 2008, penduduk nya lebih dari 380 juta, menurut anggaran penduduk di The World Factbook . Amerika Selatan keempat kedudukan antara semua benua di daerah (setelah Asia, Afrika, dan Amerika Utara) dan [Benua [# Luas dan penduduk | kelima dalam] penduduk ] (selepas Asia, Afrika, Eropah, dan Amerika Utara). Pembahagian antara Amerika Utara dan Selatan tidak jelas, terletak di suatu tempat di Tanah Genting Panama, bagaimanapun, Panama dianggap sebahagian dari Amerika Utara. A The CIA's estimate for GDP per capita (PPP) is used in the article. For the World Bank and International Monetary Fund's estimates, see List of countries by GDP (PPP) per capita. B La Paz is the administrative capital of Bolivia; Sucre is the judicial seat. C Santiago is the administrative capital of Chile; Valparaíso is the site of legislative meetings. D The figures in this table only apply to French Guiana (which is an overseas department and region of France), not France itself. E The estimated area of French Guiana varies from 83,534 to 91,000 square kilometres based on the source. F This table only takes into account French Guiana's Gross Regional Product (GRP), not the entire gross national product of France. G Aymara is given limited recognition as an official language of Peru. J Includes Easter Island in the Pacific Ocean, a Chilean territory frequently reckoned in Oceania. 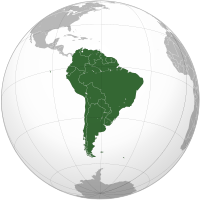 ^ a b c "The World Factbook: Argentina". CIA Directorate of Intelligence. 2008-05-15. Dicapai 2008-06-12. ^ Calvert, Peter (2004). A Political and Economic Dictionary of Latin America: an essential guide. New York: Routledge. m/s. 14. ISBN 1857432118. OCLC 57134234. ^ a b c "The World Factbook: Bolivia". CIA Directorate of Intelligence. 2008-05-15. Dicapai 2008-06-12. ^ a b c "The World Factbook: Brazil". CIA Directorate of Intelligence. 2008-05-15. Dicapai 2008-06-12. ^ a b c "The World Factbook: Chile". CIA Directorate of Intelligence. 2008-05-15. Dicapai 2008-06-12. ^ a b c "The World Factbook: Colombia". CIA Directorate of Intelligence. 2008-05-15. Dicapai 2008-06-12. ^ a b c "The World Factbook: Ecuador". CIA Directorate of Intelligence. 2008-05-15. Dicapai 2008-06-12. ^ a b c "The World Factbook: Falkland Islands (Islas Malvinas)". CIA Directorate of Intelligence. 2008-05-15. Dicapai 2008-06-12. ^ Cayenne adalah ibu negara jabatan. ^ a b c Americas Review 2003/2004: Economic and Business Report (edisi 21st). London: Kogan Page. 2003. m/s. 79. ISBN 0749440643. ISSN 1351-4571. ^ a b c (Perancis) "Résultats régionaux des enquêtes de recensement de 2004 à 2007". INSEE. Dicapai 2008-06-12. ^ a b c "The World Factbook: Guyana". CIA Directorate of Intelligence. 2008-05-15. Dicapai 2008-06-12. ^ Nohlen, Dieter (2005). Elections in the Americas: a data handbook (edisi 21st). Oxford: Oxford University Press. vol. 1, p. 359. ISBN 0-19-928357-5. OCLC 58051010. ^ a b c "The World Factbook: Paraguay". CIA Directorate of Intelligence. 2008-05-15. Dicapai 2008-06-12. ^ The New York Times Guide to Essential Knowledge: A Desk Reference for the Curious Mind, p. 845. ^ a b c "The World Factbook: Peru". CIA Directorate of Intelligence. 2008-05-15. Dicapai 2008-06-12. ^ Americas Review 2003/2004: Economic and Business Report, p. 144. ^ a b c "The World Factbook: Suriname". CIA Directorate of Intelligence. 2008-05-15. Dicapai 2008-06-12. ^ a b c "The World Factbook: Uruguay". CIA Directorate of Intelligence. 2008-05-15. Dicapai 2008-06-12. ^ a b c "The World Factbook: Venezuela". CIA Directorate of Intelligence. 2008-05-15. Dicapai 2008-06-12. ^ Redfield, Peter (2000). Space in the Tropics: From Convicts to Rockets in French Guiana. Berkeley: University of California Press. m/s. 269. ISBN 0-520-21985-6. OCLC 191037539. ^ Kozloff, Nikolas (2007). Hugo Chavez: Oil, Politics, and the Challenge to the United States. New York: Macmillan Publishers. m/s. 136. ISBN 1-4039-8409-3. OCLC 144596511. Laman ini diubah buat kali terakhir pada 17:27, 1 Oktober 2017.